We are a small, family-run independent business based on a farm in Hertfordshire. 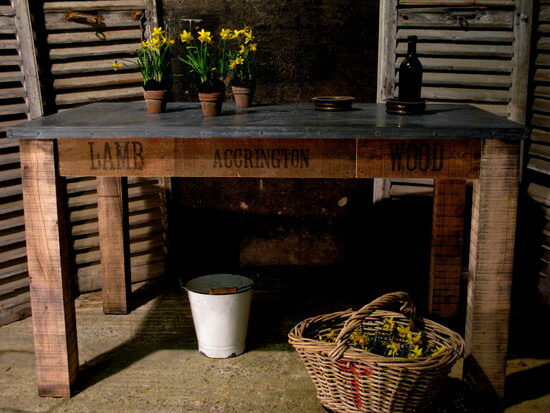 We specialise in industrial and vintage furniture and aged zinc pieces. If you are looking for an industrial chic style, reclaimed pieces and made to measure items then we are the people for you! Our hand aged zinc is the best you can get if you are looking for a uniform and authentic finish. Our tables are made from aged oak and the finest quality materials, all hand-made right here in the UK. We can make furniture to the size that you require and have a range of items including accessories and large pieces of dining furniture. Due to the nature of our product delivery charges will vary according to the distance to be travelled from Harpenden in Hertfordshire, the number of people required to deliver the item and whether the item needs to be assembled. Prices for delivery generally start at £20 (smaller items such as hooks will be delivered for £5) and increase to a maximum of £75 (with the exception of deliveries to Cornwall, Scotland and Wales- please click on the 'ask the seller a question' button for a quote). Please contact for confirmation of delivery price. Where possible we will place the item in the position desired within your home. Please contact us if you have any questions regarding delivery. We can often give you a specific delivery time within an hour and at a time that suits you. Please inform us of any parking issues or details where necessary. Orders can be cancelled within 7 days. Due to the nature of our bespoke furniture business, between 7-14 days only a 50% refund will be given on a cancelled order. After this period cancellations will not be available due to the large amount of time and labour involved in our product. Important- please be aware that many of our products are antique items and whilst we try to ensure that all our stock is high quality, it must be acknowledged that there will be some degree of wear and tear and that items will be aged in places. Our aging process is geared around the concept of aging and appropriately distressing the furniture. We try to ensure that the overall finish is clearly shown in our selected photos of the product. If concerned then please request additional photos or visit our workshop. Please be aware that reclaimed wood and aged zinc will have minor imperfections and knots, splits and cracks will be present- none of which should affect the quality or use of the product. Our solid oak can be affected by changes in temperature and humidity as will all real wood products. The effect should not impact the quality or use of the product. Due to the besoke nature and size of our items returns are only accepted where an item is faulty or damaged. Please inform us within 24hours of delivery. Please contact us if you need to discuss this further. We will always send additional photos or customers can visit the workshop if required to avoid problems.